Happy Tuesday everyone!! I hope the start of your week has been a fabulous one! I cleaned like crazy yesterday...our bathroom and our room. While our bathroom just needed a normal cleaning, our room was a completely different story. There was so much dust, it is almost embarrassing!! But now, it is clean from top to bottom and looks fabulous!! 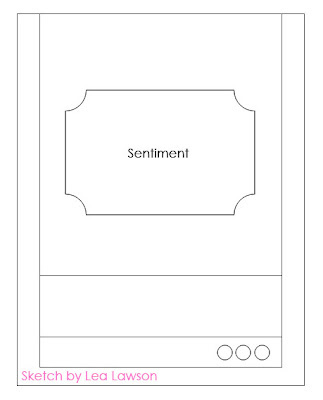 Today I have my card for this week's Skipping Stones Design sketch 65, which I happened to also design. 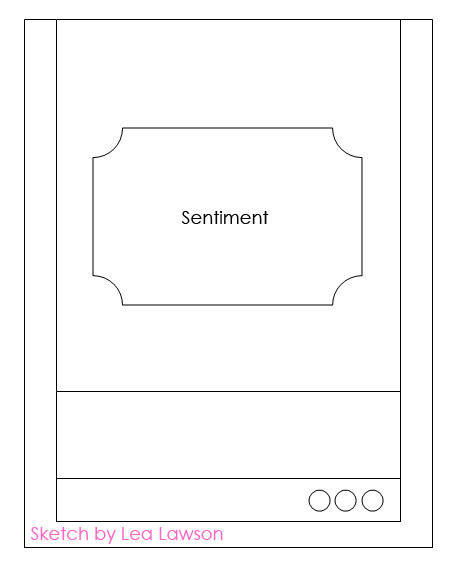 :) It is kind-of fun to design a sketch and then create a card based on your own idea... I also used one of the latest Spellbinders label die sets...I won them during their big blog hop week showcasing all the new releases before CHA. I was so excited when they landed on my doorstep, and I finally got a chance to use them!! Without further ado, here is what I came up with! Instructions: Fold cream cardstock in half to make card base, and round the bottom corners. Cut a pink paper block a bit smaller than the card front, round the bottom corners and sand the edges. Cut and emboss the label from cream cardstock, adhere to the card and stamp the sentiment to the bottom of it. Stamp the butterfly on cream cardstock, cut out and adhere to the top of the label. Accent the butterfly with three pearls. Adhere the ruffle below the label accent, and then tie ribbon around its seam. Accent the lower right corner with three pearls, and stamp the second sentiment to the left of them to finish. I don't have any first hand experience with cancer in my life, and for that I am extremely grateful. But I watched a great example in my grandma Penny, as she was there for a friend dealing with the disease. She took her friend to appointments, loved on her and was basically just there for her. I thought of this as I was looking through my SSD stamps and came upon this set, and my card just completely came together. And while I hope that I don't ever have anyone to give this card to...I do have it just in case. And I hope that I will follow in my grandma's example if I ever find myself in the same situation. And as the Skipping Stones Design sketch designer this month, I get to giveaway two stamp sets!! So, one lucky winner is going to win the stamp set released this month, "Pumpkin Seed Sentiments", and the set I showcased today, "Cancer Schmancer". Please leave one comment on this post telling me what you like best about my card, or my post in general! You have until 11:59pm MST on Sunday, February 27th to leave a comment, and I will post the winner on Monday! Good luck...I can't wait to hear your responses! Here are the images of the stamp sets so you know what you are winning! As always a stunning beauty! It is so elegant, love the light, soft colours and also the ribbons+lace! The pearls are cherry on top! You know, the card is lovely, but the little anecdote about your grandmother was even better. Thank you so much for sharing that with us. Your Card(s) are beautiful, I love the color combo on this one, so girly! That butterfly is so cute. Beautiful card! Love the pleating of ribbon and lace! Lea, your cards are always so beautiful, i would copy all of them if i could--teehee. i love the soft pink butterfly on this card (i tend to make all my butterflies bright) and the rounded corners. Thanks for another great idea! Hi Lea, your post really rang home to me today because my Mother In Law is like your granny, supporting a friend who is unfortunately losing her battle against this dreaded disease! There have been too many incidences of cancer amongst my friends, so I have to really be thankful for my health. Thank you for making me ponder on this today! (Of course your card is simply beautiful and conveys a sense of caring in that beautiful pale pink). This is stunning, Lea! WoWzA!!! I love the text "Together we can kick cancer's booty! "on your card best. It would have been perfect for my mom... Although she lost te fight in the end she never let her head down and fought the disease till the very end and surpised eveyone by keeping the fight up so long. I hope and wish for you, you'll never need that card. Absolutely gorgeous card! I love the lace ruffle and the pretty pearls! Your new Labels die rocks, too! beautiful as always, Lea! I'm digging the monochromatic hues in this card. It's been so great having you as a guest sketch artist at SSD this month. Thanks for the fun sketches! Oh wow, this is stunning! Such fabulous work with the Bo Bunny and with that lace! A wonderful card! This will be very supportive. Beautiful card Lea!! I am a HUGE ruffle fan, so of course I love the pleated ribbon and lace. So gorgeous! Thanks for the chance to win--would love those background stamps to play with! Lovely stamps and a very lovely card. I speak from experience, cancer patients need cards and this would be a welcome sight to someone! Thanks for a chance to win one. The rows of lace and ribbon are just too much! Sure makes for a girly girl card! 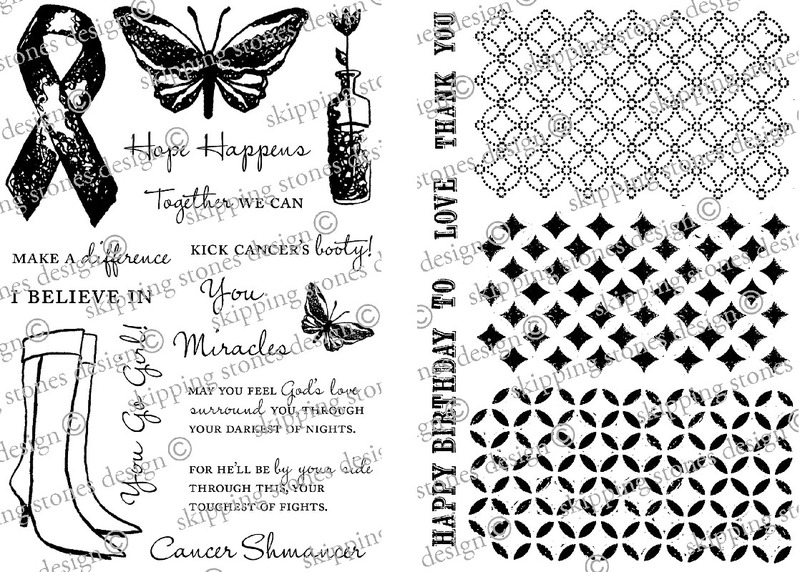 Besides the pink and the beautiful girly embellishments on your card, it calls to mind the wonderful people that are the supports of cancer patients. I used to work in Hospital Registration and it was these people that the cancer patients leaned on for support and encouragement. I think everyone needs a support system. Thanks for sharing your lovely creation. Lea, this is beautiful...I've so enjoyed your sketches this month, thanks! I love the double ribbon, lace ruffle...but really I love the whole thing! I love all the layering! I love that ribbon ruffle, so cool! The perfect finishing touch for a female support card. Thanks for the chance at the drawing, I'm nuts about background stamps so Pumpkin Seed Sentiments would make me very, very happy! Congratulations on your win - you really are putting it to the most amazingly good use - this is utterly beautiful! So delicate - it takes my breath away! Your card is perfect, the colors, the sentiment! My dad would have liked 'Cancer Shmancer'! That's one awesome stamp set, and I really like the background set too! I've enjoyed your sketches and your creations! I'd love to win the Pumpkin Seed Sentiments! I love the ruffle, the colors, the new die, the pearls...I guess I love it all! I've been eyeballing the Pumpkin Seed set--you all make it look so great! I love the lace and the pretty ribbon! But I love EVERYTHING you do, so it's hard to pin point one thing in particular. I really love that you do a variety of different styles, it inspires me! I really like the soft colors you chose. Adding the pink pearl to the butterfly was really nice. Loved all your cards, but thought the cancer card was just the best. Your butterfly is gorgeous, but my favorite part is that fun sentiment! I love it! My mom is a breast cancer survivor and I've been drawn to anything pink and cancer related for a while now. I love the sentiment you used on the card!! Your card is gorgeous! LOve the ribbon and lace! That nestie is so pretty, I need to add that to my wish list!! I love the pearls on the butterfly too! Lea, this is the first I am on your blog that I remember. Your work is so beautiful. Love this pink card. My mother in law suffered with lung cancer 40+ years ago. She lost the battle to it. I am grateful she knew the Lord and is with Him now! love the ribbon and lace! Love your card, love the butterfly and the soft colours and I wish the line on it could be the truth real soon. My niece by marriage just a week ago lost her 40 year old sister. So sad. She battled cancer for 3 years but didn't win.She's leaving behind two scared girls of 13 and 16 just missing their mom. It's a real gem! love pink. love pearls. It's a versital sketch too. Thanks for sharing! Such a beautiful card! The texture is fantastic! Your card is spectacular! I adore the lace-and-ribbon border, but most of all the sentiment. I have a friend who has been battling (and beating!!!!) breast cancer for the past year+, and I just love that there is a stamp set devoted to the fight against this disease! What a great card! The color combination is just great and LOVE your butterfly. What a beautiful card! I love the pleated ribbon look. Great cause too! I'm loving how much pink you are using! Sure did brighten my day! Of course I love your card - so beautiful and also I've loved the sketches you've created for skipping stones the last month -so inspiring!!! So what I liked best with your post was to see how you interpreted your own sketch - it actually inspired me in turn to try drawing some sketches for my own card making - something I haven't done before - THANKS! What a beautiful card! I love the pearls down the center of the butterfly. I love how elegant it is and still gets the message across that a person is stronger than cancer.